The Niagara Falls PowerHawks continued to falter with an 8-3 loss to the Skylands Kings Saturday afternoon at the Skylands Ice World in Stockholm, New Jersey. The same teams are back in action Sunday afternoon with a 12:00pm face off. Trevor Christopher opened the scoring for Skylands 4:35 into the first frame to give his team a 1-0 lead. Dylan Saccone and Zakary Sparks picked up the assists. Josh Baker doubled the Kings’ score with 3:45 left in the period. Sparks and Steven Ford were credited with the assists. The PowerHawks closed the score to 2-1 with a goal by Jack Kinsman with only 78 seconds left in the first period. Devin Johnson and Jake Pembleton provided the assists. Skylands would add another goal with only 29 seconds left in the period, scored by Steven Ford. Zach Burkhart picked up the lone assist. 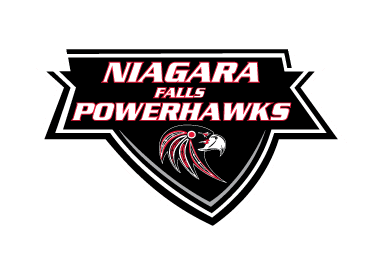 Niagara Falls struck early in the second period when Evan Shanley netted a goal 28 seconds into the frame. Dominic Cappella assisted. Cam Orzechowski tied it for the PowerHawks at 10:31 with Kinsman providing the lone assist. Josh Baker regained the lead for Skylands with 5:02 left in the period. Sparks and Dylan Dinzik were credited with the assists. Skylands extended their lead to 5-3 at 4:04 with a goal by Sparks. Jake Lissy assisted. Skylands owned the third period with three goals to put away the game. Zach Burkhart extended the least to 6-3 at 10:05, with Baker and Dinzik assisting. Jake Cicalese padded the lead 37 seconds later. Saccone grabbed the assist. Cicalese capped the scoring for the evening with a power play goal with 6:45 left in the game. Ford and Christopher were credited with the assists. Josh Sears turned away 20 of 23 shots faced in the win for the Kings. Josh Mitchell was able to stop 48 of 56 shots while in net for the PowerHawks.